Fireflies are justifiably famous for their spectacular bioluminescent courtship displays. 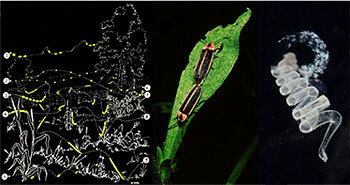 In North American Photinus fireflies, species differ both in male flash signals and females’ flash responses (see chart). Firefly females most often mate with several different males during their short adult lives, so sequential episodes of sexual selection happen before, during and after mating. Our firefly research, which is funded by the National Science Foundation, is helping to elucidate several key features of this evolutionary process. What makes a firefly attractive? How costly is bioluminescent flashing? We used a combination of open-flow respirometry and field experiments to measure two potentially important costs associated with producing bioluminescent signals: elevated energy costs and elevated predation risk. We discovered that from an energetic perspective firefly flashing (without flight) is surprisingly inexpensive; metabolic rate measured during flashing was comparable to that during walking. However, field experiments revealed a striking cost of bioluminescent signals from specialist predators: simulated courtship signals attracted many more predators (Photuris female fireflies) compared to non-flashing controls. This risk of predation may balance the force of sexual selection in which males with more conspicuous flash signals gain higher mating success. During each mating, a firefly male transfers a nuptial gift to females. This coiled, sperm-containing package (spermatophore) is manufactured by several male reproductive glands, and represents a substantial investment by the male. Once inside the female, the male spermatophore enters a specialized structure where it disintegrates over the next few days. Radiolabelling studies show the majority of spermatophore-derived amino acids are found within the female’s developing eggs.